After a successful day of ghost busting or even a long day in the office, the best way to reward your hard work is with a home cooked meal. Not everybody is a Ghostbuster but anyone can be a fan. 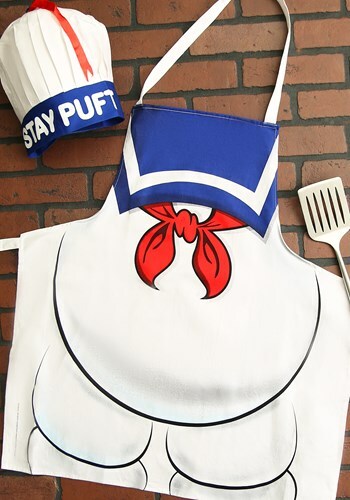 Show your own fandom and support the paranormal fighting team with this Ghostbusters Stay Puft Apron and Chef Hat Set! Once you toss on this cooking apparel, you’ll be ready to whip up a dish so good it’s scary. Not as scary as a ghost but still, so good it will give you goosebumps. Grab this Apron and hat set for a fun Halloween bar-b-que or even just for your everyday cooking attire. All your neighbors will know who to call when they want to talk about the supernatural or if they want some delicious food! Just keep an eye out for anyone suspicious with a proton pack, they may try to blast you.